Hi, my name is BETSY. I am a 6 year old female LYNX POINT SIAMESE mix. I have GORGEOUS markings, SILKY FUR, and PRETTY LIGHT BLUE EYES. My favorite thing to do is to SNUGGLE up next to you and show my affection with loud PURRS and HEAD BUTTS. I love to be PET, but when I'm done I will let you know with a meow or a gentle paw tap. I can be TALKATIVE, and will MEOW or CHIRP when I'm excited. 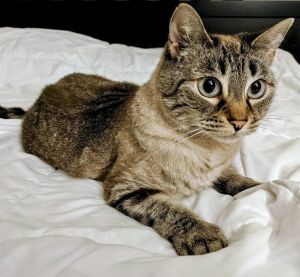 I am very LAID-BACK, but I do love to PLAY and chase my TOYS around the house too.If you're looking for a LOYAL COMPANION who is affectionate and independent, I'm your girl. I would thrive best as your “ONE and ONLY". I am spayed, UTD on shots, and FIV/FeLV negative. If you'd like to meet me, fill out an application to visit me at my foster home in MANHATTAN.